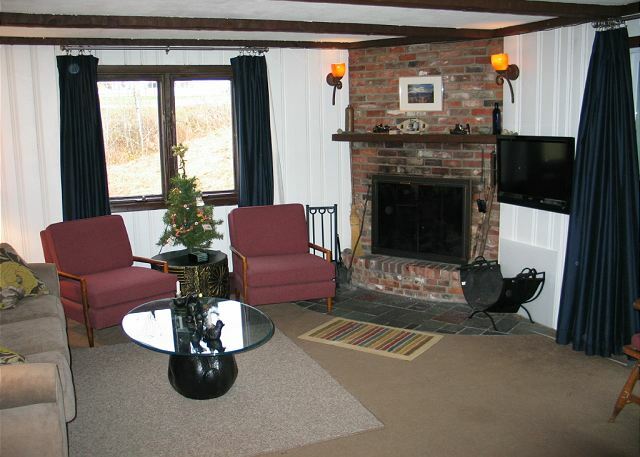 Mittersill Village Ski Venture "R"
Vacation rental condominium. 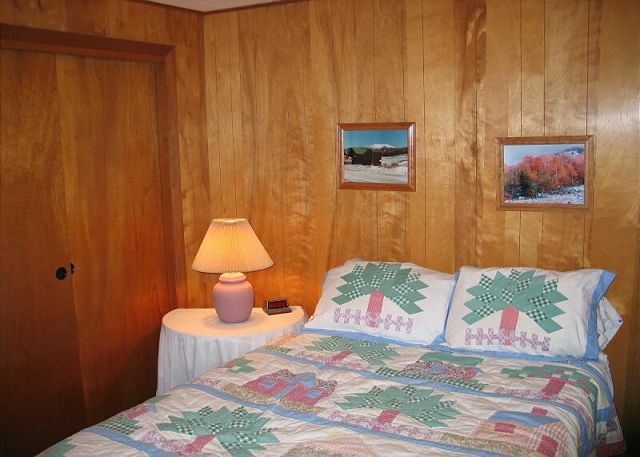 Sleeps 6, 3 bedrooms, 1 bathroom. No pets allowed. Located at the very foot of the natural snow trails of Cannon Mountain's Mittersill Village, this is the perfect Winter location! Gap jump the road and you could ski right to your door! 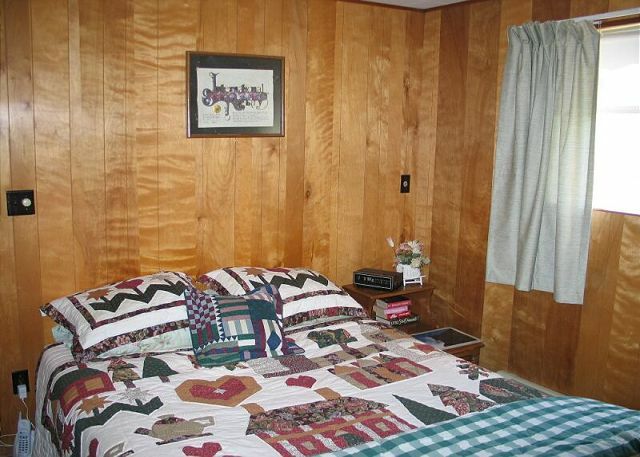 3 bedrooms, 1 full bathroom, sleeps 6. Located in the lower right side of the building. 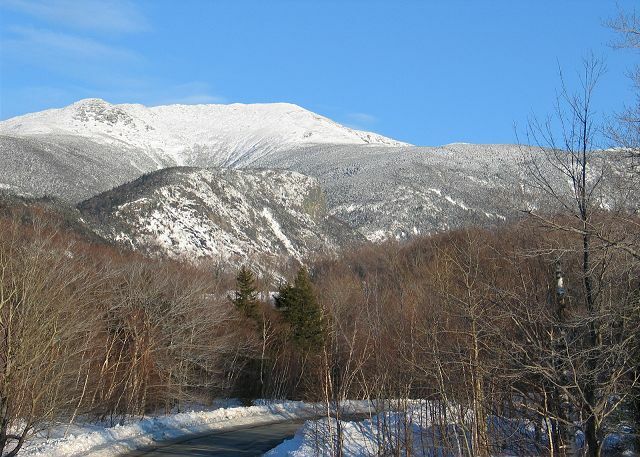 Just one more sample of what to expect while visiting the Mittersill Village and Franconia Notch State Park during our famed Winter months. 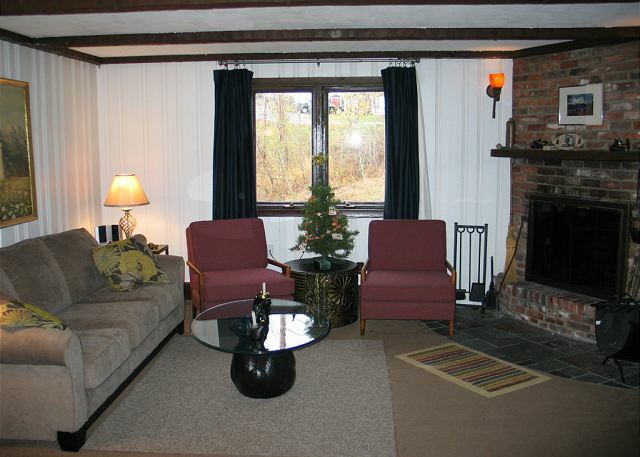 Sit in cozy comfort as you take in the views out all windows, and the warmth of the fire place. Relax in front the fire and take in your favorite television program after a long day on the mountain. 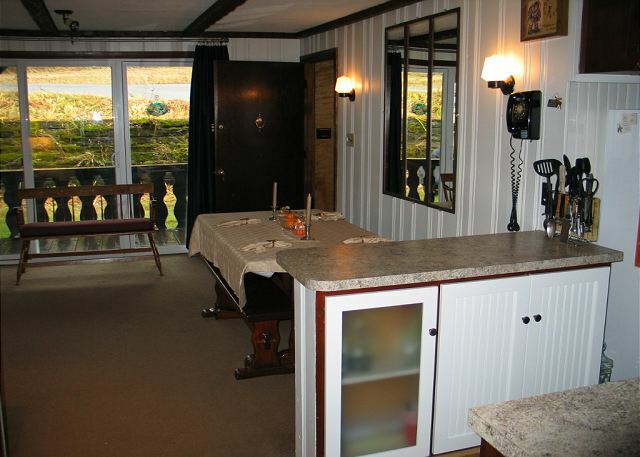 The dining/kitchen area with breakfast bar. The kitchen/dining area as seen from the main hall. 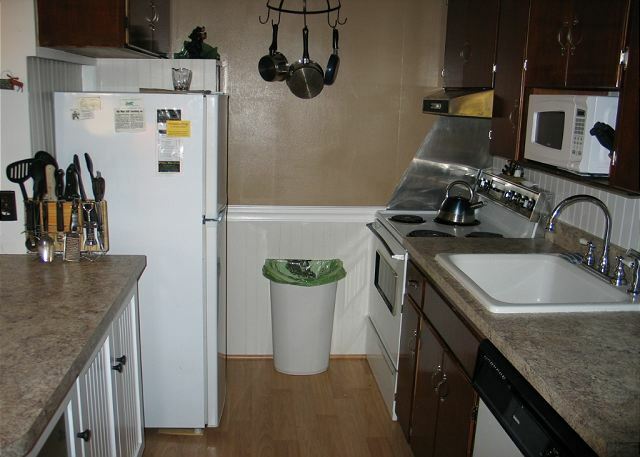 The galley style kitchen comes fully equipped with all of your household needs. Bedroom #3 with 2 twin beds - Set head-to-head, this room makes great use of the available space it has to offer. 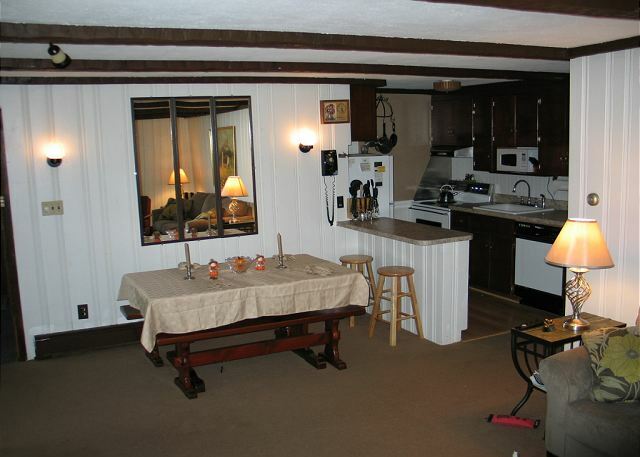 A Professionally Managed Franconia Notch Vacations Mittersill Village Chalet, this ground floor Mittersill Village Austrian style Alpine condominium provides a cozy and comfortable retreat for you and yours. The well equipped kitchen is situated to assure the cook does not get lost among the group, where the fireplace on the opposing wall assures warmth on a chilly Winter's afternoon, or cool Fall evening. The three bedroom, 1 bath layout of this home enables sleeping for six with one queen bedroom featuring A/C, one full, and 2 twin beds. Call for month or season long rates and availability, and make this Vacation Home away from home your vacation rental retreat of choice. Overall, we had a wonderful experience this past winter at this property. This is about as close to the action as it gets at Cannon. 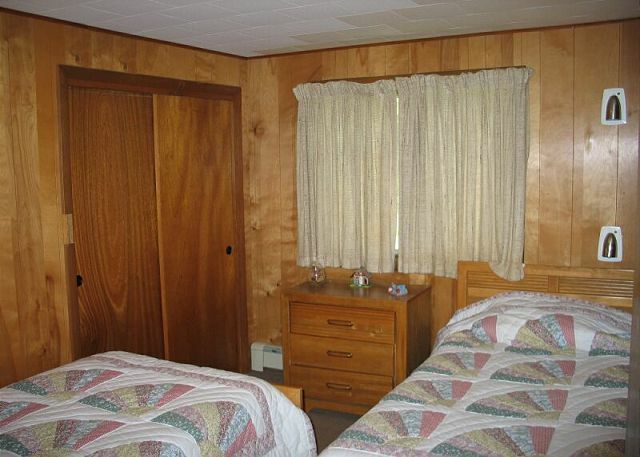 The property was clean and fairly well maintained. The mattresses could use replacing, which we've let management know. Parking at this property is a challenge. Our unit had to literally back down onto the front lawn as opposed to having a spot in the driveway. All in all, though, we'd recommend this for someone looking for a no fuss rental right on the mountain at Cannon. This stay was for a winter seasonal stay.The rental company was GREAT they made sure all my needs where met with a smile,& prompt to fix anything that was broken. I highly recommend Franconia Notch Vacations & will continue to use this service in the future. YOU ALL ROCK!!!!!!! !